In 1947, Christian Dior had a vision to become one of the world's biggest fashion empires, when he debuted his first collection. As we look at what has become of this world-renowned fashion house, we see nothing short of panache, epitomizing only elegance in both the world of fashion and the world of beauty. And as gusto as the Dior was then, today in 2018 his legacy lives on. Dior's newest collection for Pre-Fall 2019 was designed by Kim Jones and presented in Tokyo, creative and image director of Dior, Peter Philips created a dramatic yet cyber-chic look which he says is inspired by the great science-fiction classic "TRON". First and foremost, the internationally known groomer prepped the models skin. Using only Dior beauty products, his goal was to keep the models' skin as hydrated as possible. "I hydrated the skin well with the Dior Homme Dermo skincare line." Philips applied the Dior Invigorating Moisturizing Emulsion followed by the Dior Pore Control Perfecting Essence and the Dior Anti-Fatigue Firming Eye Serum. Then, Philips used the new Dior Backstage Line and Face Body Foundation. "This foundation helps obtain even skin and a clear complexion. I like it because it has an ultra-light texture and creates and incredibly natural impression," he shared with me. To complete the makeup portion of the look, he used the Dior Backstage Brow Palette followed by the Dior Diorshow Brow Styler. The look created was used to complement the innovative fashion designs for the collection. 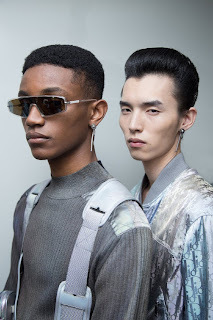 "I created these silver 3D designers, some of which have a rainbow glimmer to replicate the new Dior Logo created by Kim Jones for this new Pre-Fall collection," Philips shared. As the Dior groomer continued, he applied the actual Dior logo to some of the models just on the nape of the neck. He decided to go with a more abstract approach, so Philips applied individual letters just below the ear, as well as, on the forearms, the back of the hands and even on some of the fingers. "I wanted the look to have more of a metal sheath, as my goal for these futuristic decorations was to create a very 'robotic-chic' effect," Philips added. The hair was styled by stylist Guido Palau, who gave the models a very structured look. For this look, Palau wanted to create a very futuristic yet cyber-rock effect with controlled volume. This completes the grooming look for the Dior Men 2019 Pre-Fall Collection. For more information visit Dior today. FTC: Press article for Dior. No affiliate links used. Tonight, I decided to get Smashburger for dinner. Located in the heart of Meridian, Idaho on East Louis Drive, I was so hungry after work and took it upon myself to grab a veggie burger and French fries to-go. As the menu here is quite extensive, offering so many great options for both vegetarians and vegans, I inquired about ordering one of their newest and most popular burgers, the Triple Double using their black bean burger patty. The Triple Double burger and is served on an egg bun with lettuce, tomatoes, onions and pickles. I wanted to substitute the bun for the pretzel bun. Not because I don't like the egg bun (because it is good) but because I've never tried the pretzel bun and it looks better. The burger comes with extra American cheese. I decided to go the extra mile and order extra American cheese and extra cheddar cheese or melted aged cheddar cheese. So, what did I think? The black bean burger patty was a little soft. As it was extremely flavorful, I felt like it was a little undercooked. The pretzel bun was delicious and really complemented the burger overall. The French fries were just ok for me. They are always good as a side, but I live in Idaho and prefer the thicker, homemade style of fries. The Smash Sauce is outstanding. It is like a thousand island minus the ketchup. Better yet, if you were to make a thousand island sauce, mustard would be the main ingredient instead of ketchup. I literally would buy this sauce alone if they sold it there. Although the ranch was decent, I didn't find anything extremely special about it. Overall, dinner was great. I managed to eat everything, as I was extremely hungry. I think the next time I eat Smashburger, I will definitely try something different. Stocking stuffers are the perfect addition to every Christmas present. These tiny treats offer so much during the holiday and really complement every stand-alone gift. After all, a bunch of candy canes manifesting a stocking can be quite banal. Don't you want something unique and different this year? Stocking stuffers create more than just reactions, they create memories. So, what are the best beauty stocking stuffers? Too Faced Love Light - This outstanding stocking stuffer is one of the best highlighters you will ever use. Featuring the patented Prisma Shine, this terrific Too Faced addition utilizes only the best of powder, liquid, and even baked formulas to create only the ultimate luminous glow. Pigmented to perfection, little goes a very long way. For only $30, this is the perfect present for not just your stocking, but you too. And not only is this an incredible stocking stuffer, but an incredible deal too. Joyeux Noel! Voluspa 3 Petite Tin Candle Holiday Gift Set - With Vision of Sugar Plums, Cinnamon Ceylon and Copal, as well as, Spruce, this lavishly lux candle gift really epitomizes what the holidays are all about. For under $30, you can throw one of each or all of them in your loved ones' stocking this holiday season. FOREO LUNA play - Fun and affordable, this skin care device is great for anyone looking for beautiful skin. Using T-Sonic cleansing technology, good, great and even amazing things come in small packages as this stocking stuffer is one of them. Available in a variety of colors, the time is now to love the skin you are in. Especially for the holiday season. Only $39 at FOREO. Poopourri Secret Santa Toilet Spray Tube Gift Set - It's only natural to drop coal into potty; however, so when you check your list twice, you can give this gift to someone who has been nice. This amazing stocking stuffer features a 1.4 oz. Secret Santa which consists of vanilla, cinnamon and citrus notes. Available at Poopourri for under $10, this is one of the most creative yet festive gifts you can give this holiday season. Benefit Sweeten Up, Buttercup! - This limited-edition Benefit gift features the famous Benefit BADgal Bang mascara in full-size, a full-size of the Gimme Brow+ in shade 03, the full-size POREfessional Face Primer, and the Hoola Bronzer in a mini size. Included with these products is a creatively cute makeup bag. Amazing right? And for only $39 at Benefit Cosmetics, this is a great stocking stuffer for the beauty lover in your life. Perfect in every beauty enthusiast's stocking, this sweet gift set is fully dressed for the holidays. Q-tips Beauty Rounds - When it comes to producing quality products at amazing prices, Q-tips knows all about it. In fact, for under $5 at Walmart, this amazing Q-tips stocking stuffer features 75 dual-sized cotton rounds that are perfect for removing your makeup. As they work to assist with toning, these fabulous flat rounds are also amazing for removing nail polish too. As the perfect present for every stocking, anyone who receives these will love them. LuMee Duo Mobile Case - This case provides strong protection while utilizing duo lighting including a selective dimmer that changes the lights brightness. Also includes a rechargeable battery, which extends its use and longevity. With everything from marble to even glitter to choose from, this case epitomizes the word "selfie". Available for virtually every single phone device including Apple iPhone and Samsung Galaxy, this is the ultimate cell phone case for the ultimate selfie lover. NCLA Designer Nail Wraps - Whether you are searching for seasonal nail wraps, this Los Angeles based beauty brand has them. They also offer an array of collections which give you such an extensive selection to choose from. Are you looking for glitter? What about glam? Perhaps yu are searching for something a little more opaque or even something somewhat transparent? All you do is apply them and you are good to go. Plus removing them is quite a breeze too. For $16 each, these nail wraps make an incredible stocking stuffer. Sign up today to receive emails from NCLA directly and receive an additional 15% off your entire purchase. Boscia 'Dig Deep' The Charcoal Skin Kit - This wonderful Boscia addition has everything you need for a perfectly pore-less complexion. For under $40, you will receive the award-winning luminizing black mask along with deluxe sizes of the detoxifying black cleanser and charcoal pore pudding. You will also receive one pore purifying black strip. Although most would consider this a mini stand-alone gift rather than a stocking stuffer, because of the size this would be fabulous in every stocking. Style Edit Root Touch-Up - Do you know anyone with gray hair? What about someone who colors their hair? If so, this is the perfect stocking stuffer as well as, side gift for them. The color binding complex works great for every hair type and hair color. Free of peroxide, parabens, amonia and other synthetic chemicals, you can find this gem for only $24.50 at the Depasquale Spa. First Aid Beauty FAB Cleanse and Exfoliate Kit - This dynamic duo features everything you need to create a clean yet luminous complexion. In fact, this set includes the face cleanser and the facial radiance pads. Recommended by dermatologists world-wide, this is safe for every skin type including sensitive skin. As a $15 value, this stocking stuffer can be your's right now for only $10. Tis the season to great skin and an even greater new you. Sign up for emails and receive 15% off today. VitaBath Body Cream Trio - With the essence of gourmand, floral and sugar it just doesn't get anymore delicious. For only $4.95, you will receive three mini body creams in VitaBath's number one selling scents - Heavenly Coconut Cream, Lavender Chamomile and Pomegranate Bellini Blush. Perfect for traveling, this triple threat has turned into the ultimate gift set and one of the best stocking stuffers you can give and get this holiday season. Tarte Maracuja Gold Oil - As an essential oil, rich in fatty acids this little gem works to correct, prevent and even repair various forms of DNA damage as well as, environmental stressors. It also works to deliver instantaneous and long-lasting hydration. For the holidays this year, Tarte decided to create a dazzling yet decorative maracuja oil that is dressed for your face. If you or someone you know loves gold or anything that embraces skin health, this is the perfect stocking stuffer. For $50, this limited-edition maracuja oil can be your's today. PHYTO Huile Supreme Rich Smoothing Oil - As one of the hautest (and hottest) hair care brands to come from France, PHYTO uses an array of natural ingredients that know how to treat the tresses. Available in Soyeuse, which is the lightweight hydrating oil and great for those of you with dry and fine hair and available in Supreme, which is the rich smoothing oil and wonderful for those with dry and thick hair, these phenomenal PHYTO additions really embody luxury hair care at it's finest. For only $40 (or $80 for the two), they both fit perfectly into every stocking? Luminess Wink and Kiss Duo Lipsticks - Brought to you by the makers of Luminess Air, the Wink and Kiss Duo Lipsticks allow you to experience a dynamic duo your lips and lashes are destined to appreciate. For only $29.99 (a $44 value), you can experience both an intense yet long-lasting lip color that will last you through the entire night along with an voluminizing mascara your lashes are destined to love. As one of the most innovative concepts of 2018, when it comes to stocking stuffers and beauty, this is truly a winner. Pacifica Wake Up To Roses Set - This Pacifica gift features three hand creams inflused with coconut water and a plethora of healthy ingredients and antioxidants. As a $20 value, this set includes the Rose Komucha Flower Powdered Face Wash, the Dreamy Youth Day and Night Face Cream and the Wake Up Beautiful Super Hydration Sleepover Mask as well as, the Rose Water lip balm. For only $15 at Pacifica Beauty, you can stuff one large stocking or place them into three individual stockings and whoever receives them will love you more for it. NEOCELL Beauty Bursts Soft Chews - With 0 fat grams, over 2,000 mg of hydrolyzed collagen and 20 mg of hyaluronic acid, this is one of the healthiest beauty treats in the world. Whether you are looking for beautiful skin, beautiful hair or beautiful nails, this beauty chew is the perfect alternative to any candy out there. For under $20, these beauty bursts are available in both chocolate mint and fruit punch. You can stuff every stocking under the sun with these and everyone who receives them will love you that much more for it. Beekman 1802 Goat Milk Soap Collection - With 7 choices to choose from, the selection is supremely extensive. Although this set retails for $60, it is currently available at EVINE for $44 and if you order it today, it can be your's for only $39.26. Also, you can make 6 payments using their Value Pay system so you would only have to pay $6.54 for 6 months. Amazing right? To top it off, Beekman embraces the natural concept and every soap is free of sulfates, parabens, petroleum and phosphates. Great for both men and women, this botanical-based soap will leave your skin looking, feeling and even smelling amazing. Tangle Teezer Compact Styler - Who knew that one of the greatest hair brushes ever would fit into every stocking under the sun. If you are searching for the perfect stocking stuffer this holiday, this amazingly innovative brush is the one. Available in an array of shades and designs, you can brush your hair in seconds. 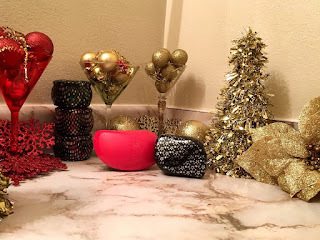 Available at your nearest Tangle Teezer retailer, including the official site and Sephora for $20 and under, this is one of the greatest stocking stuffers of the year. And right now, 25% off is yours today. Kylie Cosmetics Holiday Mini 8 Piece Lip Set - This set includes two velvet liquid lipsticks, four matte liquid lipsticks and two metal liquid lipsticks. Perfect for travel, you can give one to your wife, your mother, your fiancé, your girlfriend, your sister, your sister-in-law and any woman in your life and they will love you much more for it. For just $42, tis the season to hot lips and many cocoa sips. EOS Holiday Lip Balm with Tin - Every night is a Winter night with these three incredible EOS lip balms. Certified organic, you will receive an evolution of smooth lip balm in First Snow, Fireside Chai and in Pomegranate Raspberry. For under $10, this isn't just one of the best stocking stuffers of 2018, but one of the best steals (and deals) too. Korres Sleeping Beauties Overnight Treatment Trio - This tremendous trio of skin treats features the Korres wild rose advanced brightening sleeping facial, the Greek yoghurt advanced nourishing sleeping facial, and the black pine firming, lifting and anti-wrinkle night cream. For under $50, this is not only one of the best beauty gifts you can give this holiday, but you can stuff these little gems in a stocking and whoever receives them will love them. Pixi Beauty Mesmerizing Mineral Palette - This palette is available in nine unique palettes including four new shades, each palette features six shades. Do you know someone who loves blue? Perhaps they would find the Aquamarine Dream palette appealing. What about purple? If so, they are going to love the Amethyst Aura. For just $12 each, you can create so many different looks and everyone who receives this will be happy. LEADERS 7 Wonders Masks - Everyone needs a little pampering. You know, that "me" time? The great news is, you can really indulge in all things good this holiday season by treating yourself and your loved ones to an affordable yet effective sheet mask. Available in an array of formulas for every skin type under the sun, you can find these amazing little gems at your nearest ULTA for only $6 each. Sign up for LEADER's emails and receive 10% off your first order. Bath and Body Works Winter Candy Apple Mini Cosmetic Bag Gift Set - When it comes to gift giving, the ideas are endless, but only a few manage to stand out this holiday and this is one of them. In fact, this Bath and Body Works gift features four travel-size essentials which include the ultra shea body cream, fine fragrance mist, hand cream and the award-winning PocketBac Hand Sanimagnificent makeup bag that you can use all year round. Available in one of the best fragrances Bath and Body Works offers, this fantastic foursome is the perfect present for not just your stocking, but you too. Kate Spade NYC Truly Collection Coffret - The holidays are officially here. This set includes: TRULYdazzling Eau de Toilette, TRULYgracious Eau de Toilette, TRULYdaring Eau de Toilette, and the TRULYtimeless Eau de Toilette in .25 oz. size. Available only at ULTA beauty, this $30 perfume set proves that good things come in fours. RIP Kate Spade. Pond's Wet Cleansing Towelettes - Trusted by dermatologists world-wide, these hypoallergenic cloths are the ultimate add-on. Available in Original Fresh, Luminous Clean, Evening Soothe and Exfoliating Renewal these towelettes make the best stocking stuffer this holiday season. For under $5 for 30 towelettes or under $10 for 75, this will complement more than just a stocking, but the skin of whoever receives and uses these too. Lavanila Stocking Stuffer Duo - This dashingly fab duo features both the award-winning Lavanila deodorant and a roller ball of fragrance. Using beta glucan technology, this deodorant works to deliver long-lasting odor protection without the use of lab created chemicals and ingredients. Available in Pure Vanilla, Vanilla Coconut, Vanilla Lavender and Vanilla Grapefruit. You can stuff one stocking or you can stuff three individual stockings. For only $20 at Lavanila, this limited-edition gift is part of this year's holiday collection. Are the best things in life really free or are they just natural? Peter Thomas Roth Mask Frenzy - Attention all facial mask enthusiasts, this is the greatest gift you can give to your loved ones. Especially to those who love a fantastic facial mask. This set includes six of your favorites in one gift. The masks included in this set are: Hungarian Thermal Water Mineral-Rich Atomic Heat Mask, Rose Stem Cell Bio-Repair Mask, Cucumber Gel Mask Extreme De-Tox Hydrator, Irish Moor Mud Purifying Black Mask, Pumpkin Enzyme Mask Dermal Resurfacer and my favorite, the 24K Gold Pure Luxury Lift and Firm Mask. Stuff one in a stocking or stuff them all, whoever receives them will not only love them but appreciate them much more so. As a $254 value, this can be yours now for only $75. BROO Bar Shampoo - Do you know a beer lover? What about a hair lover who appreciates beer? Either way you put it, the BROO Bar Shampoo is for you. Perfect for both men and women, this novel yet effective beauty gift is the ultimate stocking stuffer. Are you looking for moisture? Great for multiple uses, this bar is available in two unique formulas - Hydrating (infused with coconut oil and smells like bergamot) and Energizing (infused with caffeine and green tea extract and smells like lime and ginger) so if you can't decide on one, get both. Avon Fragrance Gift Set - Avon is one of the most popular beauty brands in the world and some of the most popular fragrances are Avon exclusives. Available at Avon, prices started at $20 and go up from there. Every gift set is unique and offers something special, making them great stocking stuffers. You can take the gift and spread it into separate stocking stuffers which is fantastic. Not only are the fragrances fantastic for the value, but you are getting a set that can fill an entire stocking. Jamberry Nail Wraps - Not only does Jamberry offer a plethora of colors and designs, but they allow you to shop by collection. For only $15, you can wear everything from 'Champagne Frost' to 'Christmas Socks' to even 'Apple Cider' and much more. Are you looking for something from the runway? What about something simple yet chic? Tis the season to beautiful nails and one of the best beauty essentials you can place into a stocking. Caudalie Organic Grape Water - When it comes to embracing natural beauty, this French brand knows all about it. In fact, they only use the finest natural ingredients. One thing I love about this product is that it is 100% organic grape water. It is great for hydrating the skin and contains natural polysaccharides which give your skin immediate moisture without clogging your pores. Only $10 for a travel size and $18 for a full-size, this wonderful skin care essential is not only perfect for every skin type, but every stocking of every beauty lover out there. Keratin Complex Infusion Therapy Keratin Replenisher - Whether you are searching for immediate hydration or looking to smoothe your hair, this product is one to not only love, but appreciate. It also works to protect your hair, as it repairs it. For just $40, this hair treatment can be placed into the stocking of every hair lover in your life. For a limited-time if you purchase $20 or more of Keratin Complex from ULTA you can receive the smaller 1 oz. of this free. How is that for a beauty deal? Q-tips Travel Pack - Some of the best stocking stuffers are those essentials that you can take virtually everywhere. Especially if you are traveling and need the perfect purse sized essential. Available with pink or blue casing, this wonderful Q-tips addition provides you with 30 Q-tips cottom swabs. For under $3 at Walmart, this purse pack of goodness is not only something one would love let alone want, but it's something one would need too. The next time you reach for the stocking, you may want to consider adding some of these amazing beauty essentials into it. Say goodbye to candy canes and hello to beauty. The clock is ticking and December 25th is approaching. Happy Holidays! FTC: Holiday gift guide. All opinions are my own. No affiliate links used. As Christmas is near, the holidays are officially here. As we enjoyed Thanksgiving with our family, friends and other loved ones, we had the opportunity to discover great deals and sales just a day after for Black Friday. Cyber Monday (November 26th) is the biggest online shopping day of the year. With only a few days away, one of my personal favorite places to shop is Target. 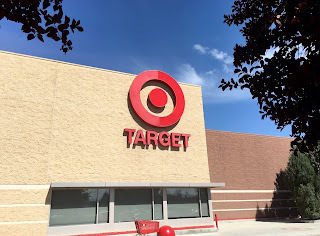 Target has many great items and offers a mixed balance of low-end, drugstore, mid-end and even high-end and luxury. With many exclusives and limited-edition products, it is the best place to shop for everything from your favorite beauty products to groceries and much more. - Get 40% off select home items. Take an extra 15% off when you purchase any furniture or rug. Use code: TURKEY at checkout. - Get a $30 off original price plus a free $10 Target gift card when you purchase a Instant Pot Duo Pressure Cooker. - Get $100 off Xbox One X. In addition to this deal, Target is offering video games starting at just $15. Amazing right? - Free shipping. There is no minimum amount to purchase. 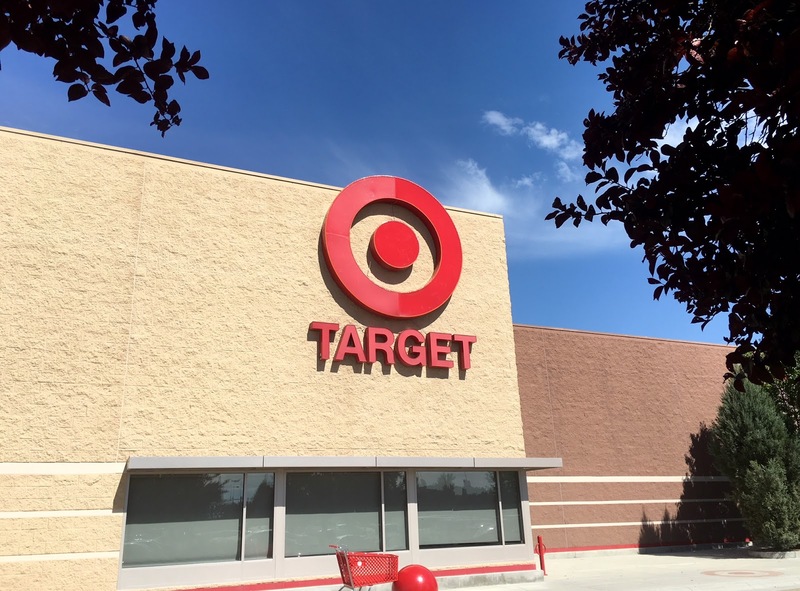 This is an ongoing incentive Target offers on hundreds of thousands of items. As a result of this special deal, the internationally known store also offers free returns. You can also send most items site-to-store which means, you can pick it up. - Get 30% off from Cratejoy on participating boxes at Target. They offer over a thousand different subscription boxes from some of your favorite products and brands. Use code: CYBER18. - Get 25% off on all orders $250 or more when you purchase Ninja or any Ninja kitchen brand products. Some of their blenders are fantastic. Use code: CMONDAY25AF. If you spend $150 or more, you can use code: CMONDAY20AF to get 20% off your entire purchase. - Kerastase Paris is offering a great deal this Cyber Monday through Target. When you spend $100, you will get $15 off your entire purchase, as when you spend $150, you will receive a special savings of $25. Kerastase Paris makes some of the best shampoo and conditioner I have ever used. Use code: VIP18. - Lenovo is offering many great deals this Cyber Monday. Up to 54% off select computers, laptops and tablets. Starting at $99.99 (and imagine paying less than half price for this). While supplies last. - Get 20% off your purchase of $150 or more when you purchase anything through the Shark or Shark clean brand. Use code: CMONDAY20AF. Only at Target. - For Cyber Monday this year, Mark's brand is offering up to 70% off regularly priced items. This special deal also includes free shipping. - If you have shopped on Black Friday this year and spent $50 or more, Target should have emailed you a coupon to use which gives you 20% off your entire purchase (in addition to the exclusive sales, deals and other incentives) which you can use between 11/27-12/8 this year. If you make a purchase right now, you will receive this incentive to redeem later. Great for last minute holiday shopping. - If you open a REDcard (Target's official credit or charge card) you will receive 5% off your entire purchase every time you use it. This incentive is also in addition to the exclusive sales and deals offered from the world-renowned department store. To open a card, just click here right now. - Don't forget to check Target's ongoing sale racks and specials. They also have great clearance sections which are added to both their site and in-store daily. And also offer areas where everything is $1 or less. FTC: Cyber Monday 2018 at Target. All opinions are my own. Not sponsored. Some affiliate links used. J.Cat Beauty Sparkling Palette in Jibiri. It is official, the holidays are here. With only a little over a month until Christmas, there is a lot to do until the bells ring into the most anticipated day of the year. When you glance at the list of people you have to buy for this year, you notice a lot of people are unchecked. After routine examination, you realize most of them are beauty lovers. The only problem is, you have a budget of $5. What do you buy? But the question remains; however, is it possible to spend less than $5 on a beauty gift? The answer is: absolutely. So, what are 5 beauty gifts under $5? You don't have to spend a fortune let alone break your budget this holiday, as there are many gifts under $5 including these five beauty gifts. Happy Holidays! FTC: Holiday Gift Guide 2018. All opinions are my own. No affiliate links used. Thanksgiving is one of the most underrated holidays of the year. At least, in my opinion. And in case you are unaware, Thanksgiving is a holiday held every fourth Thursday of every November. Originally celebrated by the pilgrims in the early 1620s, this holiday really exudes so much to be grateful for. Since 1789, what started as an idea was denied by Thomas Jefferson to make Thanksgiving an official holiday here in the United States. It wasn't until 1863, then president Abraham Lincoln made the day an official holiday. Thanksgiving was celebrated as the last week of Thursday before president Franklin D. Roosevelt took it upon himself to make it the fourth Thursday of the month. 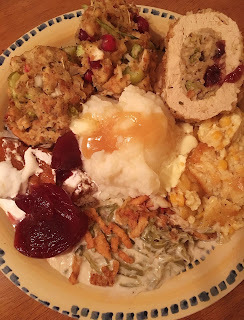 When I was a little girl, my mother use to make a dinner on Thanksgiving Eve. It would consist of gourmet sandwiches, hors d'eouvres, and pie. The family would reminisce about life, liberty and the pursuit of happiness over hot chocolate and Christmas music. Most of the time, my mom would get very little sleep because she would be in the kitchen by early am cooking the Thanksgiving meal. 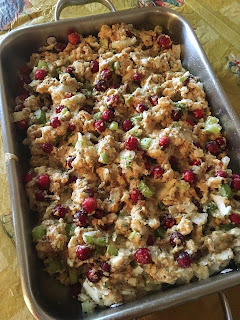 Every year she made homemade stuffing (some people refer to it as "dressing" and even "breading") which she would make alone and stuff in the turkey. Then, she would make many sides including classic dishes which are a favorite to this day. The evening would end with an endless amount of cookies and pies, which were always apple or pumpkin themed. My mom has always been a wonderful woman and I always admired the fact she could take a lot on in spite of working a full time job. Especially when it comes to cooking and baking. Perhaps this is where I got it from. She's in her early 60s now and still manages to do great things in which I respect her immensely. And mom, if you are reading this - I love you. But the question remains: what am I truly thankful for? - First and foremost, I am really thankful to have food to eat. When you look at the world fully, rather than one-dimensionally it is crystal clear that most are unfortunate and do not have food to eat, let alone have the privilege of enjoying a big meal like Thanksgiving with family, friends and loved ones. I am grateful to be able to sit and enjoy good food today with good people. - As a vegetarian of many years, I can admit that I am in good health. Amazing health actually. Aside from suffering from mild depression (which I really believe is only sporadic) I am both disease-free and drug-free. I do no suffer from any health problem at all. As a 38 year old woman, I am thankful to be in amazing health. - A lot of people assume you can live without clothing, but to me, I find it virtually impossible. In fact, the vast majority of status quo society would also share the same mindset in terms of clothing. Especially when we live on a planet that suffers from several problematic climate issues which include global warming. Some people can't afford a warm coat to wear during the winter. This is why I am thankful to have clothes to wear. - I must say that I am very thankful to have a roof over my head. If you can imagine how many people don't have shelter nor even a place to go, if you have a warm place in which you can call "home" to go to everyday, you should be thankful. I know, I am. That goes without saying, if you have food to eat, clothes to wear and a roof over your head, you are still richer than 80% of the world. - Life is one thing I am grateful and thankful for. I know this is probably a banal response to the question "What are your thankful for?" however, if you really look at this question, it is only natural to be thankful for life. Right? I am very blessed to live today to write this blog post. There are many who are no longer with us, as there are many who have died young. RIP Morgan. RIP Angela. I am so thankful to be waking up today. - And with life comes love. 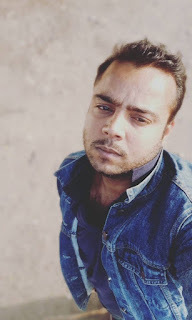 I am thankful to have met Sumit. To have found love in my life. Not only is he the love of my life, but he has changed my life for the better. I feel like life, my life has more meaning because of him and with him in my life, I am more motivated and driven than ever. Sumit has changed my perception about quite a few things in which I am both genuinely and wholeheartedly grateful. 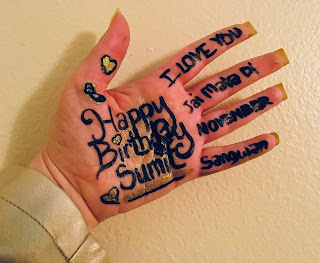 And Sumit, if you are reading this - I love you. - When it comes to working, a lot of people are unable to find employment. I am very lucky to have a job. A job that I enjoy. Academic credentials and a strong work ethic can only go so far in this life, as even a Harvard grad may be unable to find employment in this age. I am thankful to have a job. - Anyone who is reading this blog post. Yes - you. Thank you. On the 22nd of November, I can sit and remember this day forever. As I sip on my moscato writing this blog post, I am can admit that I am so thankful for happiness and very happy today. From my home, to your home - Happy Thanksgiving! When one thinks of technology, they often think of innovation, creativity and the most importantly - growth. Without technology, there is no growth and without growth there is no progress. And without progress there is no way to evolve. Everything that has been done can only be recycled so many times before it becomes banal and useless. Technology is all about change, as technology is all about going upward and moving forward. High-tech has changed the evolution of the world, including the world of beauty. The question remains; however, what are the best high-tech beauty gifts this year? I want to also add that you should advantage of Planet Beauty's loyalty program this Friday where you can earn points when you shop and save money as a result. 350 points is equivalent to $15. And if you become a platinum member, you can say an additional 20% off the sale price plus you will earn 1.5 points for every dollar spent and you will receive 750 points just for joining. And it is free shipping all over the United States. Clarisonic SMART Profile - Not only will this high-tech beauty gem remove your makeup over 11 times better than the traditional hand wash method, but it removes various environmental stressors such as pollution, etc. 30 times better than the same method. Can you believe it? This system features four speeds and reads everything including the brush heads you place with it. Whether you are searching for a smarter cleanse that is more powerful and effective or simply looking for that life changing device, this is it. For just $265, this facial and body cleansing device really is SMART. Luminess Legend Airbrush System - This airbrush system works generously to prevent and eliminate cross contamination. It is also compact and fits in most handbags. For under $250, this high-tech airbrush system provides you with easy, quick and most importantly, long-lasting application while delivering real results. This entire set has everything you need to put your best face forward. This is truly a legend. FOREO LUNA - It isn't everyday that you will find a device that features a deep yet gentle facial cleanse that also provides your skin with anti-aging technology that works to reduce fine lines and prevent them from happening. This little high-tech gem also firms the skin. Normal skin, check. Combination skin, check. Oily skin, check. Sensitive skin, check. For under $200, this is a hybrid in it's own right and is truly amazing for every skin type. Right now you can save 30% on this device. The Conture - When it comes to beauty-forward essentials, this revolutionary device works to stimulate your skin by gently lifting and releasing target skin areas using an unique vacuum system. As a pain-free and safe beauty tool, you can expect real results. Great for both the face and the neck. Available for just $199, the Conture launched several years ago and still remains to be a real tried and true gem in the world of beauty. 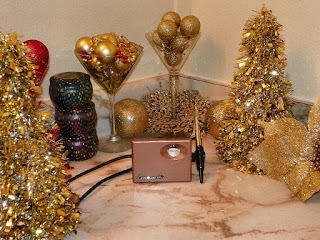 DermaFlash 2.0 - Utilizing sonic technology, the DermaFlash proves why it should be on your Christmas List this year. Whether you have normal skin, dry skin, oily skin, combination skin and even sensitive skin; this device will work to exfoliate your skin by removing the dead skin cells from beneath the surface. Great for those who suffer from uneven skin tone and depigmentation, it will also remove any excess facial hair (or "peach fuzz") too. For just $189, this award-winning device is not just one of the greatest high-tech beauty gifts of 2018 but one of the greatest devices of the year. NuFace Mini Toning Device - Reducing the appearance of fine lines and wrinkles, this FDA-approved device delivers real results within just a week. I have used this incredible device and noticed results immediately, which was surprising as I didn't think it existed. Not only will this device both contour and tone your skin, it will treat acne and acne breakouts too. Perfect for traveling, this is one of the greatest high-tech beauty devices of 2018. For under $200, you can make any beauty lover's year this year. Red Carpet Manicure LED Pro 45 Light - This light was designed to dry virtually every nail polish and cure Red Carpet Manicure's special LED polish in less than one minute. And the best part is, your manicure will last up to two weeks. Prep, care, color, and finish. For only $50, you can make a nail lover's year this year. T3 Cura Luxe Hair Dryer - Implementing and executing IonAir technology, this digitally controlled gem offers five heats with two speed settings, allowing your hair to dry effectively without destroying it. It also features an actual volume control switch which is essential for achieving a real, tried and true salon look. I have tried many different hair dryers this year, but always find myself loving the blow outs this one creates. If you know someone who needs a hair dryer or anyone who just loves their hair, I'm pretty sure they will love this beauty gift also. GHD Platinum+Professional Styler - What I love most about this styler is the fact that it works to straighten and smooth your hair without pulling your hair. For under $250, this flat iron features an amazing hinge, advanced floating plates, an incredible heat protector, an universal voltage and automatic shut off along with a sturdy swivel cord making one of the first of it's kind and one of the best high-tech beauty gifts right now. The GHD Platinum Styler is also pretty bank too. TRIA Beauty Hair Removal 4X Laser - This FDA-approved device really proves that you don't have to spend thousands on hair removal treatments, when you can remove hair both effectively and efficiently in the comfort of your own home. Yes, this device is powered by the same technology (Diode) which is used often in many clinics. If you don't believe me, just take a chance as this product also comes with a 60-day money back guarantee. And for Black Friday (November 23, 2018) you can save 15%. In fact, I think this deal is right now so it get it before it is gone. You won't be disappointed. FOREO ISSA mini 2 - Made from durable silicone, this toothbrush is as innovative as it gets. Using Sonic Pulse technology, the ISSA mini will not only effectively clean your teeth, but protect your teeth too. On top of that, you use your phone to charge it. Available in 4 fun colors, this toothbrush is a new approach to dental care. For under $120 (and currently on sale for under $100) this toothbrush is great for children, teens and adults and the perfect high-tech gift for every beauty lover in your life. Baby Quasar Pure Rayz - LEDs emit natural wavelengths of light which work to stimulate your skin's cells. As an FDA-cleared device that is compact, this is one of the best ways to reduce wrinkles. Great for every skin type and skin tone, this award-winning device uses 40 LEDS along with four distinct wavelengths of light, which work for even penetration. On top of that, you are getting the highest power of output which means you are getting a high level of collagen production. For under $250, you can expect to notice results within a few weeks. Juverest The Sleep Wrinkle Pillow - As one of the newest ways to deal with facial wrinkling, this pillow works to minimize facial contact with the pillow surface. In short, this prevents wrinkles from happening. Made from 100% polyurethane-foam, this is very soft and comfortable. For under $160, this pillow not only works to prevent and repair sleep wrinkles, it changes your entire sleep regimen which reduces further damage. And as it does this, corrects both neck and back alignment. What makes this pillow high-tech? This pillow helps maintain a youthful appearance. Nutra Luxe MD Nutrastim Pro Hair Laser Comb - What I found fascinating about this handheld, cordless high-tech beauty device is the fact that it utilizes laser light to stimulate hair growth. And although it is considered low level, it has proved to treat those individuals who suffer from acute hair loss including those who suffer from moderate alopecia. The guarantee is real and if you are dissatisfied you can send the device back for a refund. But trust me, this works. Available now for $279, you can use code: Save20 to save money on this wonderful FDA-approved gem just in time for the holidays. Beauty Bioscience GloPro - What do you get when tiny microneedles gently separate the skin's and create imperceptible micro-channels? This device. This beauty gadget also uses the skin's natural regeneration response to create new cells. Kind of like how a plant uses light via photosynthesis with an amplified effect. Offering four unique tips, this is the ultimate game changer in beauty. #Glogetter approved. Sarah Potempa Beachwaver Pro - Created by celebrity hairstylist Sarah Potempa, this high-tech hair gem leaves a lot to desire. In fact, what makes this curling iron so fabulous goes beyond it's beveled design and tourmaline infused with gold powder to protect your hair. It rotates automatically and will rotate left and right, depending on the direction you are going and side you are curling. For under $200, this rotating curling iron is truly innovative and guides you into true hair glamour and greatness. LumaRx Full Body Hair Removal Device - Utilizing Professional Intense Pulsed Light (or IPL) technology, this device offers five energy levels which work to customize your treatments. Not only does this product guarantee 94% permanent hair removal in just three treatments, it is ideal for both large and small areas of the body. So, you can use this product on your legs, your arms, and even your face too. Using ComfortFilter technology, this product is safe to use. For under $450, this high-tech beauty gadget is a real, tried and true steal. Kathy Ireland Skincare by ReVive Anti-Aging Light Therapy - After using this product you will notice that your skin's texture and tone will improve dramatically, as will your actual skin. Skin will appear more radiant as the collagen and elastin will be stimulated. This is one of the most natural yet effective ways to treat an array of skin issues. This FDA-cleared light therapy device features a portable device for under $50, a clinical device for under $170, and full-face beauty panel for under $400, making it one of the most effective high-tech additions to the beauty world right now. CandyLipz Lip Pump - Featuring four unique models, this device is for every lip under the sun. Whether you have thin lips or full lips, this device works efficiently and effectively to plump and lift your lips. Studies have been conducted and show that lips increased almost 40% from their original lip size. The results are very much real, making the CandyLipz lip pump one of the best high-tech beauty gifts there is. For under $70, you will not find another device as impressive as this one for the price point. And for a limited-time only, if you purchase one device, you will get one free. Yes! With Black Friday a few days ago and Cyber Monday only a week away, the time is now to take advantage of these amazing incentives. T3 Whirl Trio Interchangeable Styling Wand - For $270, this styling wand features three unique barrels that are powered by tourmaline and infrared technology which work to prevent heat damage. Using 5 settings, this wand also features an interlock system that makes it easy to change the barrels while prevents your hair device from overheating. Aside from that, it includes heat-resistant gloves and a mat which is quite secure. Great for all hair types, this is a winner. iluminage Skin Rejuvenating Pillowcase - Featuring a thread count of 249, this pillowcase uses 100% Cupron copper oxide polyester, which works to restore and renewal your skin while you sleep. As an essential mineral with many benefits, copper is used to stimulate the natural proteins in your skin while protecting your skin's natural acid mantle. Grab yourself a standard size for only $60 or a king size for only $15 more and you are good to go. Lumee Duo Phone Case - This phone case provides your phone with both front and back facing lights. Featuring studio lighting which includes a half an hour of brightness, this case uses Tapering Light Technology. It also includes a rechargeable battery, so you can use the case again and again and again. Although this is much different compared to other beauty gifts I have featured in this article, I had to share this one with you. I love my Lumee cases and have not used anything, but these on my phone for the last three years. TRIA Beauty 'SmoothBeauty' Eye Wrinkle Laser - What I love about this terrific TRIA Beauty addition is the fact that it uses the skin's surface to penetrate microscopic zones within the skin, treating and preventing aging. Amazing right? And as a result, this device stimulates collagen and elastin production within the area, promoting and generating new skin cells. This beauty gadget is both safe and effective, as it is FDA-approved. I have used this product sporadically for about a year now and I don't have any crow's feet or fine lines around my eyes. LightStim for Acne - There is something that should be said about LED light therapy. It delivers lights the same way plants absorb light or light energy from the sun. When plants grow, they grow because of this. Now imagine your skin. What happens when LED touches your skin? It grows the same way. This device works to regenerate and restore skin proteins and cells. For under $170, this is the best high-tech beauty gift for those looking to prevent, correct and repair acne. It is efficient, effective and the best way to clear up acne. Say goodbye to breakouts, say hello to beautiful skin. Sultra 'The Bombshell' Curling Iron - Whether you have ultra-thick hair or ultra-thin hair, dry or damaged hair, than this hair device is for you. Using ThermaTru Ceramic technology, this curling iron works to prevent your hair from heat damage. Great for those with color treated tresses, this spectacular Sultra addition also includes auto shut off features too. For only $130, this curling iron is one of the best high-tech hair gifts you can buy this year. When it comes to cutting edge technology, these beauty essentials definitely prove why they are the best gifts to give this holiday season. Whether you are a high-tech beauty junkie like me or know someone who enjoys an unique beauty gift, these options are perfect. Happy Holidays! FTC: Holiday gift guide 2018. All opinions are my own. Some affiliate links used. I am a firm believer that the best things in life are not free, but rather happen naturally. You see, several months ago I met a wonderful man from North India. We would talk sporadically about life and liberty, but just on a platonic, friendship level. Needless to say, I was very intrigued by him in many ways. He was not only intellectually endowed, but strikingly handsome with more drive than NASCAR. And the fact he had direction towards goals and pursuits and not the local dive bar was impressive. One thing that was very obvious to me was the fact that every time he would say anything to me, I felt as if I were speaking to someone who possessed supreme wisdom (which is a rarity in this world, especially in 2018), as everything he said was projected both skillfully and perspicaciously. After about a month of talking everyday, we both realized that we loved each other. It was not planned. It just happened. And as our love continues to grow more and more, each and everyday, I find myself falling more and more, head-over-heels in love with him. Does that make sense? There are so many things I love about him. Where do I start? The way he expresses his thoughts as if he's lived for centuries, the way he can describe something and possess so much knowledge about it, his spirituality and how he sees good in almost everything, his loyalty and devotion, as well as; his dedication to me and the love we have and of course, his sparkling brown eyes and incredible smile. Falling in love can be hard, yes and may also be even more complicated than solving the hodge conjecture; however, when love happens naturally and finds you, that is what makes the love greater and in the end, the love I have for 'Sumit' makes the world go round. You see, Sumit (that is his name) gives me a reason to not only love and appreciate him, but myself, my life and those around me too. He made me realize that life is valuable and every minute, second and moment is a memory-breeding journey that can take you virtually anywhere in life, as long as you let it. Sumit, taught me so many vital lessons about life and has allowed me to experience what happiness truly is, as he brightens my day everyday. He told me never to regret anything in life and live life like it is your last day, every day. He also taught me that amazing things can happen when you don't try to look for them and that a light at the end of the tunnel exists. He encourages me to be a stronger, well rounded person daily and for that I am truly grateful. With a heart of platinum, there is no one on the planet like Sumit. He is someone I can see myself growing old with and if I am being honest with myself, I would say that I can see myself with him forever. Sumit (and I know you are reading this) I want you to know everyday with you in my life is a true blessing. I am so lucky to be the one to grow with you. You are truly the love in my heart and the love of my life. In the end, we are made for each other. Life has a purpose and a meaning with you in it. Sumit, I am so thankful that came into my life, as there is no one on earth who can take your place. You make me the happiest I have ever been. I wish you only the best life can bring you, as I wish you the best success, joy, and prosperity. You are my sun, my moon, my star and my heart. And whether near or far, I love you so much.